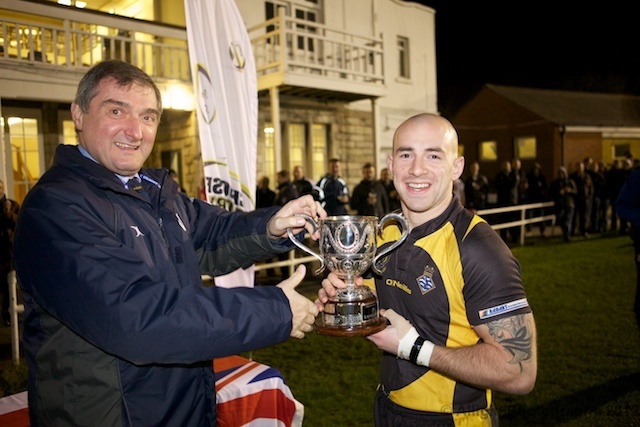 Last season’s President, Admiral Sir Trevor Soar, presents the Navy Cup to the winning HMS Seahawk captain. The latest page, in an attempt to capture the history of NavyRugby, went live a couple of days ago. It can be found on this site under the Navy Rugby menu. In researching the information I have found that the engraving on the Navy Cup has an error and HMS Heron have won the cup on fewer occasions than might otherwise be claimed. Further research is ongoing and it will be updated on the page when found. HMS Sultan prepared for their semi final encounter with HMNB Portsmouth next week with a match away at Bournemouth. They will have been well pleased with the performance and the 21-12 victory.